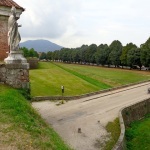 Whether you are sightseeing, out for exercise or enjoying some form of recreation, Lucca’s 2 1/2 mile (4 km) medieval wall walk is an experience that shouldn’t be missed. 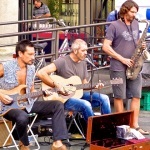 Located just 50 miles northwest of Florence and a mere 20 miles from the Mediterranean Sea, this Tuscan town has a lot of soul. I took a stroll around the perimeter one afternoon last September while catching glimpses of the medieval center. Outside the walls, broad green lawns edged by trees inspired a leisurely ambience as fresh air breezed softly over the open expanse. Walkers, joggers, bicyclists and rollerblades filled the road, engaged in the moment. 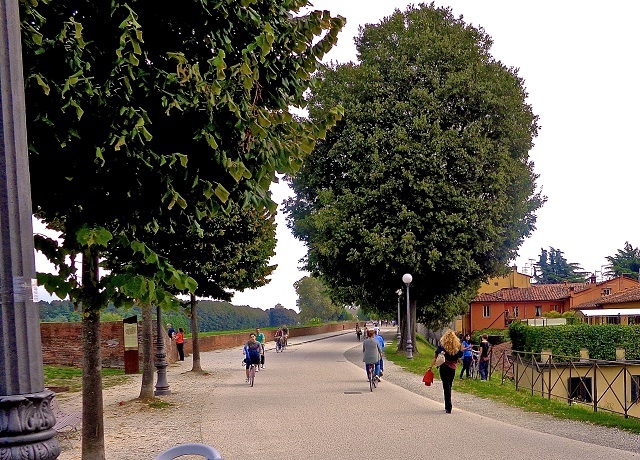 Lucca’s public walkway is a popular place to be for locals and tourists alike. Famous for its Renaissance city walls, it is the only town in Italy with fortifications that entirely surround the medieval village. The once heavily fortified military walls constructed during the Middle Ages have gone through four interesting stages of modifications. Following early Etruscan settlements, the Romans established a town here in 180 BC. Very few remains can be seen of the ancient walls that encircled the village during this time. 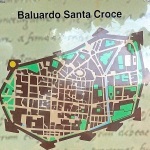 As the town expanded, another wall was constructed during the 11th – 12th centuries. A third wall extended the perimeters in the 14th century. Finally, with the expansion of military science as well as the town itself, special architects modified the walls during the 16th – 17th centuries. The walls were constructed with eleven ramparts. Three of the gates were built in the 16th century. Some operate as a drawbridge with chains or by roller gate. A few are iron studded. Although the walls of Lucca were never used in warfare, over 120 bronze cannons were discovered that were intended for military use. Each of the four sides of the walkway are lined with a different species of centuries-old trees. Expansive shade provides a refreshing experience. 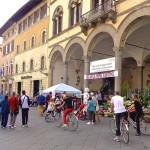 The central piazza is alive with produce stands, street entertainment, wine tasting and shopping. Several quaint cafes and bars offer a restful repast with outdoor tables perfect for people watching. Accompanied by a cappuccino or a glass of wine and aperitif, it becomes a festive affair. Maze like streets wind throughout the village and offer several photographic nooks and crannies. Chic boutiques and restaurants are plentiful. 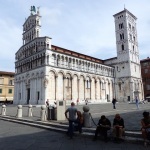 The basilica of San Michele is in the center piazza. Built on top of the ancient Roman Forum (in foro) in 777, it is dedicated to the archangel Michael. Every column surrounding the upper structure is different from the others. Some are elaborately carved, others are twisted and spiraling. Michael, the archangel that stands on top, has hinged wings that retract in the wind. Lucca is in a class of its own. If I could go back and revisit a town in Italy, this one would be at the top. Why? Because I love a city with spirit. Lucca honors and embraces its unique beginnings which remain the vital heartbeat of this vibrant community today. Susan Nelson’s love for Italy began 12 years ago when she took a two week whirlwind tour of this lovely country. Since then she has been back several times only to fall more deeply in love with the culture, history, people and beauty of this country. 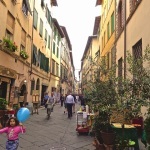 She has written over 100 posts on her blog, Italy, from St. Peter to Caravaggio, and has done guest posts for Boomer Women Travelers among a few other online travel publications. You can most always find her in her home office researching and writing new articles that intrigue her about Italy. Follow Susan on Twitter. 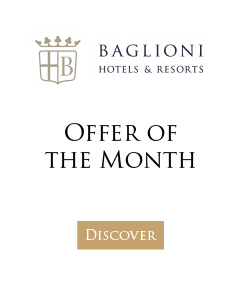 Concierge tip: Relais Santa Croce in Florence offers the ideal base for enjoying the best of both worlds: a day trip to Lucca combined with a stay in the heart of Florence’s historic centre. And for added intrigue, why not treat yourself to the guided Inferno tour revealed in Dan Brown’s latest masterpiece?